BID levy payers will have recently received a letter explaining the make-up of the interim BID Leicester Board. The existing steering group took the decision to establish an interim Board for the first year of BID to ensure there was a decision-making structure in place ready for commencement. The Board is made up of business people from within the city centre that were involved in the development of BID Leicester. Ahead of the second year of the BID all levy payers will be contacted in writing and offered the opportunity to express an interest in becoming a BID Leicester Board member. The likely time commitments and responsibilities of being on the Board will be outlined. 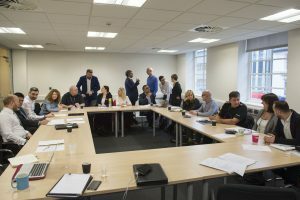 To ensure BID Leicester is engaging with businesses in the city centre across all sectors and of all sizes, a new BID steering group will also be established in Year 1. If you are interested in being part of the group we would really like to hear from you. Members of the steering group must be willing to represent and engage with other businesses in their sector and/or character area. The group shall have no more than 12 permanent members, but others may be invited to attend specific meetings depending on topics being discussed and at the discretion of the interim BID Board. To guarantee the voice of the steering group is heard it will be chaired by a member of the Board. Steering group members will sign up to a public code of conduct, agreeing to publicly support the work of the BID and act as an ambassador for the city of Leicester. 1) The steering group shall meet no less than 7 days before the Board on a quarterly basis. 2) The group shall provide both tactical and strategic advice to the BID team as well as the Board. 3) The group will provide recommendations on all aspects of the BID delivery, which will then be highlighted at the subsequent BID Board meeting. Should you be interested in sitting on the steering group please contact us at info@bidleicester.co.uk with your name and a short statement of why you would like to be a member of this group.